Add Graphics, Streaming, Recording & Video Playback to your ATEM! mimoLive is a Multi-In Multi-Out Live Video Software Engine that runs on your Mac computer. 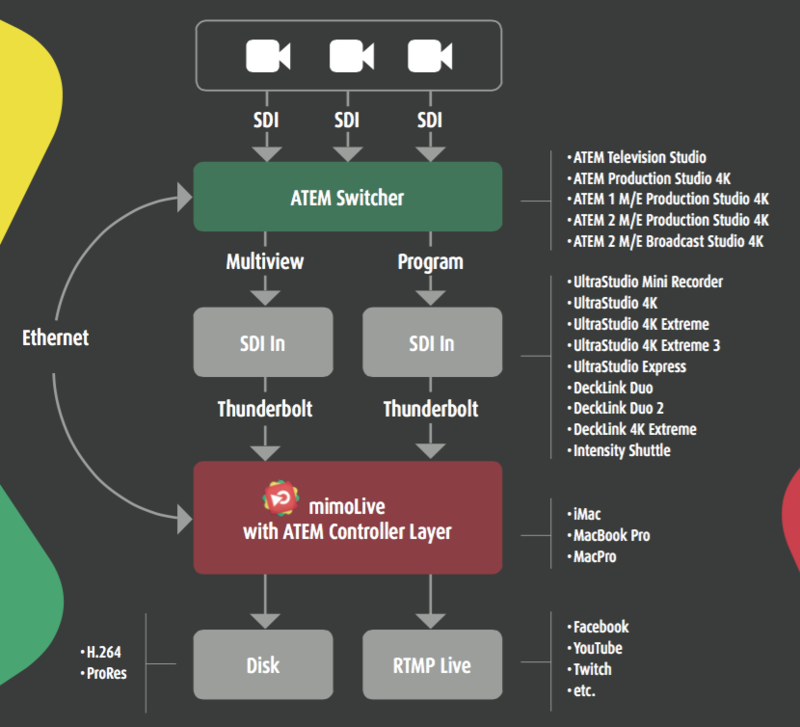 Juice up your Blackmagic Design ATEM Switcher with mimoLive! Easily add broadcast graphics such as lower thirds, station logo, news tickers, sport scores, stock charts, weather maps and more. Play out video files without the need to convert them first. mimoLive provides format and frame rate conversion, scaling, cropping and more in realtime. Optionally control the ATEM switcher directly from within mimoLive (requires the ATEM Controller add-on). A Mac with mimoLive generates your broadcast graphics, including lower thirds, Twitter feed, RSS Tickers, Station logo and more, and provides a video signal, separated into key and fill, through a Blackmagic Design SDI ouput device into the Blackmagic Design ATEM Switcher. The program signal is composed in the ATEM Switcher. The Blackmagic Design ATEM switcher is used to switch the cameras and provides the multview and program signals via a Blackmagic Design SDI output device to the Mac running mimoLive. mimoLive uses the video signal to compose the complete output, records it to disk, plays it out to a projector or streams it live to YouTube or Facebook. The optional ATEM Controller Layer in mimoLive is used to view the multiview and control the ATEM switcher over Ethernet.